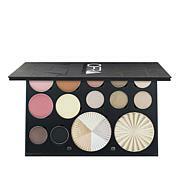 All-in-one palette featuring Banana Powder, 8 eyeshadows, 3 bronzers and 2 highlighters. Ingredients: Highlighter/Blush: Mica, Zinc Stearate, Nylon 12, Aluminum Starch Octenylsuccinate, Magnesium Aluminum Silicate, Silica, Trimethysiloxysilicate, Dimethicone, Ethylene/Acrylic Acid Copolymer, Phenoxyethanol, Triethoxycaprylylsilane, Ethylhexyglycerin. May Contain: Titanium Dioxide, Iron Oxides. Eyeshadow/Banana Powder Ingredients: Mica, Zinc Stearate, Starch Octenylsuccinate, Dimethicone, Silica, Nylon 12, Magnesium Silicate, Trimethysiloxysilicate, Ethylene/Acrylic Acid Copolymer, Phenoxyethanol (And) Ethylhexyglycerin. May Contain: Titanium Dioxide, Iron Oxides, Manganese Violet, Ultramarines, Chromium Oxide Green. 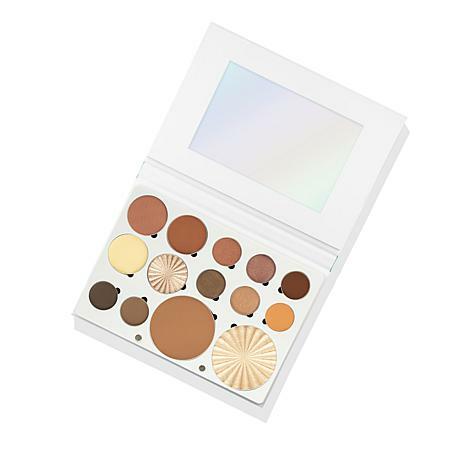 Bronzer Ingredients: Mica, Zinc Stearate, Starch Octenylsuccinate, Dimethicone, Silica, Nylon 12, Magnesium Silicate, Trimethysiloxysilicate, Ethylene/Acrylic Acid Copolymer, Phenoxyethanol (And) Ethylhexyglycerin, MAY CONTAIN: Titanium Dioxide, Iron Oxides.